The White House has unveiled its Christmas Decor for 2018. In sharp contrast to the White House Christmas Tour 2017, this year the White House decided on crimson topiary trees to line the east colonnade. The “official” White House Christmas Tree is on display in the Blue Room. At 18-feet-tall, the Fraser Fir from North Carolina is decorated with over 500 ft of blue velvet ribbon embroidered in gold with each state and territory’s name. The entrance to the Blue Room from the Grand Foyer is stunning. The White House’s Cross Hall connects the Grand Foyer to the State Dining Room and the East Room. The Vermeil Room’s mantel underneath a portrait of Claudia (Lady Bird) Johnson. Decorations in the Red Room represent America’s children. The East Room is decorated with noble firs. Red ornaments of all sizes decorate the trees in the grand foyer. The State Dining Room incorporate roses and oak leaves on the mantle and a huge bouquet of white roses. Delicate White House ornaments grace the trees. And the reflection of city skylines is seen in the mirror. Lastly, the White House pastry team re-created famous DC buildings in this year’s 225-pound gingerbread house. Whatever our political affiliation, I think we can all appreciate the beauty of Christmas decor. 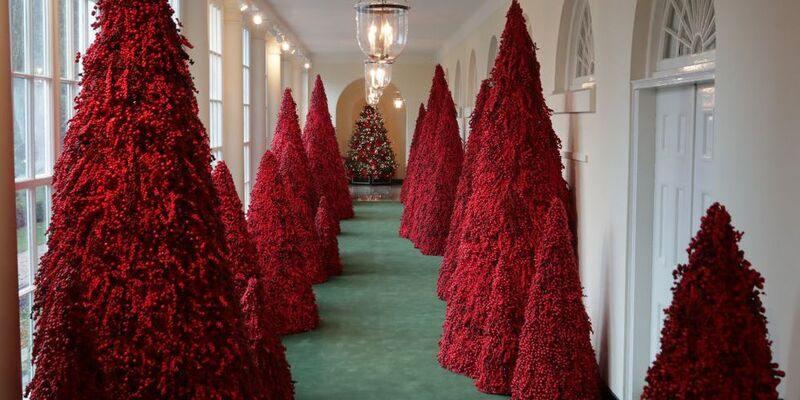 I love this year’s White House decor, but not a huge fan of the red crimson trees, although they are very eye catching. I love the white trees that lined the east colonnade last year, they were simply stunning, my all time favorite. What about you all, what do you like? The red trees with the green carpet are atrocious. Not much way around that. Yea..not a fan either. Interesting choice for sure. I think I preferred last years too…..there is something about red trees that is too fake…….blue would be nice though. I don’t remember the blue trees, I’ll have to check that out. Silver, gold or champagne would be nice too. No….I meant for the future! Aren’t the decorations lovely! Another Beautiful Job! Hi Kathryn, I’m so glad you enjoyed the pictures. The White House does an amazing job each and every year, always changing things around. Thanks for visiting. I think the red trees have gone too far with it this year. It looks like a haunted forest and it gives the feelings of evil. It is indeed very ugly. But the rest of the decorations are beautiful. Thank you for bringing that to us Denise. I wish you a happy season! Hi Juli, the red trees are different for sure. I don’t think they are ugly, just not my taste. Hope you’re having a good holiday!